Of course it's early. But the reason this isn't just clickbait is because of how the Big Ten has started, and how Wisconsin's schedule lines up. First, let's take a look at the teams that can reasonably be believed to be "in the hunt." For this, we'll turn to kenpom. At least a couple of those teams actually ended up winning at least a share of the conference title, so as a rule, Pomeroy rankings falling within these bounds should be taken seriously. And with only 6 years of data available, it's definitely possible we'll see contenders falling outside this range. Still, for now, let's draw the line at 60. Below this, entering conference play, and it's very unlikely you have a puncher's chance at winning the conference. Michigan State picked up what I think will be a great road win at Minnesota already, making quick work of the reports of Sparty's premature demise. If you can brush off the home loss to Northeastern as the product of fluke shooting by the Huskies paired with the absence of Miles Bridges and the naivete of not understanding the need for Nick Ward to receive minutes in abundance, then this is a team that's only lost to some really good opponents away from East Lansing. And it's likely the Spartans emerge from the week unscathed, as they play Rutgers and Penn State. The bad news is that this is the only time Michigan State will face those two teams, who project to be the worst in the conference. From a wins and losses standpoint, the schedule will not be MSU's friend this season. That said, Wisconsin only plays them each once, as well. Michigan lost at Iowa on Sunday, which isn't such a terrible thing but there does not appear to be a lot of margin for error for this Wolverine team to win the title. Like the Spartans, Michigan plays Rutgers and PSU each just once as well. Still, this week Michigan plays at home against Penn State and Maryland, and should be a comfortable favorite in both games. Ohio State may well find itself eliminated for all practical purposes after this week. First, the Buckeyes will try to defend the home floor from Purdue before trying to steal a game in Minneapolis. OSU will be an underdog in both games. Lose both, combined with the fact that they also only play PSU/Rutgers once (who exactly do the Nittany Lions and Scarlet Knights play this season? ), and I'm willing to strike them from consideration. It's 2017 and I'm talking seriously about the possibility that Northwestern will win the Big Ten. Is it likely? No, of course not. Personally I think the Wildcats lack the frontcourt depth needed to score in the paint, which is going to make things difficult for the talented backcourt (we'll see how Dererk Pardon fares in his comeback). But much, much crazier things have happened. Take a moment to digest that. Fun stuff, huh? This week will be something of a "Prove it" week for Chris Collins' team, hosting Minnesota and going on the road to face the suddenly formidable Cornhuskers. Right now, NU looks like a slight favorite in both games. Win those, and we'll talk even more seriously about this subject. Speaking of Minnesota, the home loss to Michigan State was disappointing, but the road win at Purdue more than made up for it. Realistically, a 1-1 record after the first two games was a pretty good outcome. But Richard Pitino won't get to celebrate the Boiler win for long, as his team faces Northwestern and Ohio State this week, before heading to East Lansing next Wednesday. If the calculator holds and they lose two out of those three, it will be tough for them to catch up to the Badgers (who, again, we're assuming beat both Indiana and Purdue for the purposes of this hypothetical). But let's talk about those teams—first, Purdue. Before playing Wisconsin, the Boilers will try to beat Ohio State in Columbus. Both teams are smarting off a loss, and it looks like Purdue will be a slight favorite. But I've all but given up trying to forecast the Buckeyes. This is a team that nearly won in Charlottesville, but also lost at home to Florida Atlantic. On an on-paper, recruiting-ranking basis, Ohio State is the most talented team in the Big Ten. They cannot be overlooked. If Purdue trips up against the Buckeyes and Badgers, that three-loss deficit might be enough to keep them out of the race. And finally, Indiana. The Hoosiers followed up a home loss to Nebraska with an out-of-conference loss to Louisville in Indianapolis. The latter game wasn't very close, either. Some of that was of course due to IU managing to shoot just 4/21 from 3, but there was also the fact that Louisville made 59 percent of its two-point shots. And this is a Louisville team that, frankly, is not all that great at converting 2s on the season. Those 22s at the bottom are his attempts at the rim, and that list actually keeps scrolling. What you see here are all the attempts that do not fall into the "at the rim" category. I've counted—there's 32 of them, with just 8 shots on the season coming outside of the paint. How does he do it? At 6-8 with just average athleticism, Happ probably isn't the type of player you'd expect, given the shot chart and the interior dominance. But he's tremendously effective, largely because he's a very confident dribbler in the post. He gets low, allowing him to get by the initial defender. Moreover, he understands how to score along the baseline (including plenty of pump fakes), meaning he can limit the effectiveness of help defense. And finally, he's a gifted passer out of the post (a staple for Wisconsin big men), so defenses cannot sell out on him lest they risk a kickout to an open shooter. I've put together a little bit of film showing some of this at work. Defenders that keep themselves between Happ and the hoop, and stay disciplined on the fakes, can neutralize Happ. 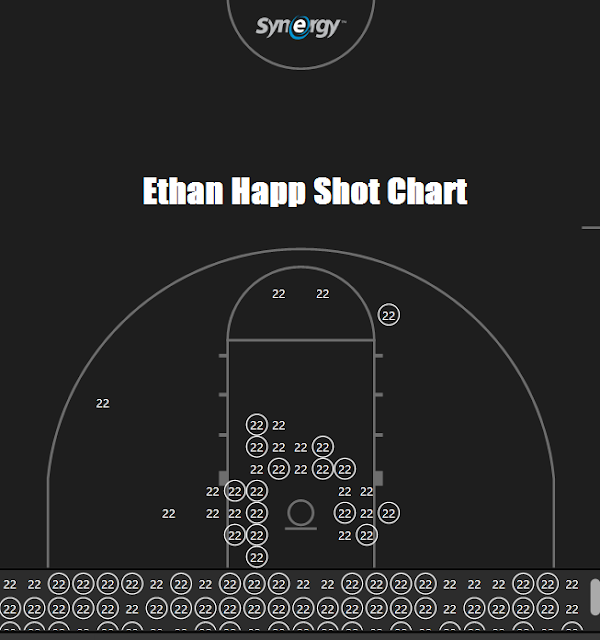 Bringing help defense is a dicey proposition given Wisconsin's shooters, and frankly, Happ is prone to turnovers if he holds the ball for more than a beat after his primary move. I suspect that Tom Crean will put Thomas Bryant on Happ to start, although it's a bit of pick-your-poison, because Nigel Hayes isn't exactly easy to contain, either. Juwan Morgan is a mediocre defender. OG Anunoby I suspect could give Happ some trouble, and sticking OG/Bryant on Happ/Hayes may well be the gameplan, with Crean trusting Morgan to stay home on Vitto Brown roaming the perimeter (assuming Crean doesn't go small—which he may well do in any event). But if the Hoosiers can't contain the Badger offense tonight, Wisconsin would seemingly have a significant leg up in the conference title race.